The Wirral is another area where we seem to be growing in stature re our spooky books. First port of call, a new school, Redcourt St Anselm’s. 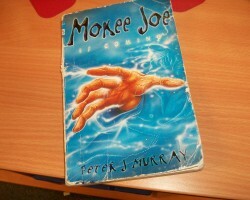 This is a small independent school, but full of avid readers and now, we are pleased to say, full of Mokee Joe fans. We acquired a visit to this lovely school via courtesy of a good friend and huge fan. 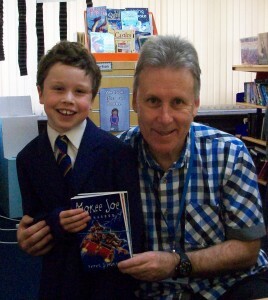 Francis is a Year 5 pupil and we owe much to him for spreading the word on the popularity of our books. Hope you like the pic of us, Francis! And a big ‘thank you’ to Ms Mazumder for being such a lovely hostess. 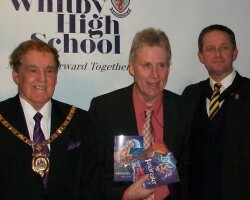 The Mayor, the author and the Headteacher! and then…back to work…to Whitby High School, for our third visit. A big audience of Year 8’s gave us their undivided attention as we went into ‘high scare mode’ with three of our scariest books, Moonwailer, Scabbajack and Ten O’ Clock Caller. Judging by the expressions on the sea of Year 8 faces, they were more than up for the scary nature of the seriously spooky tales and I’ve a feeling we may well be signing quite a few books before the week’s out. Tomorrow is a repeat performance with the Year 7’s and then it’s into the ‘whistle and flute’ (suit) for the evening’s presentation at which yours truly is making a short speech (I’ve promised it will be short!) before making the awards to lots of amazing pupils…can’t wait! Well…the presentation was a great experience, much due to the brilliant organisation by Lynne and the other teaching staff. It was an absolute pleasure to meet up with the deserving recipients of the awards (so much talent out there!) and also to meet the Headteacher, Mr Heeley, the governors and the charismatic Mayor, Brian Jones. Everyone made Kath and I feel so welcome. I’m pleased to report that my speech seemed to go down well, despite the references to many tombstones, including my own! The student presentations went down extremely well and the subsequent book-signings, especially with Year 7, were VERY busy. I also noted the copies of my books in the library were almost worn out. There’s nothing more gratifying to an author than seeing a tattered and well-thumbed copy of their book! Thank you, Mr Heeley, Pat O’ Boyle and all of the staff and pupils at Whitby High for giving us such a great time during our stay with you. We’ll see you all again next year. Have a great Christmas! We celebrated my 10th Anniversary as a children’s author spending a week with some of our biggest fans up in Yarm and at Stockton-On-Tees. Conyers High School is a great place to be for Kath and I – our good friend and librarian, Kim Dawson, always ensures we are well fed and looked after. Instead of having the new intake of Year 7’s en masse as per last year, this time we had them in three large groups and each session proved a great success. After signing books at Conyers, it was time to get down to the fab Stockton Library, where our hostess, Lucy, was waiting to organise our library events over the next few days. We saw lots of children from lots of schools and even did an evening session on ‘How To Get Published’ – this proved a great hit with our adult writers who turned up for the session. The climax to the week was a huge presentation in the state-of-the-art Yarm School theatre in front of around 450 pupils from all over Stockton. The school’s two librarians, Deborah and Katherine, ensured all went smoothly and it seems we are going to be back at this stunning location next year to launch my new scary football book. enveloped in a ‘book culture’ and live and breathe books. 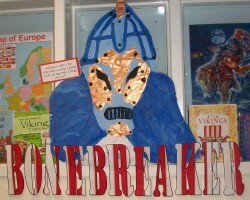 Our son and author, Simon, joined us in working for three days with Years 5 and 6. Personally, I’ve never done so many classroom-based writing workshops, but enjoyed every minute of them…all of the pupils without exception so keen to listen and learn from our experiences. It was also of added interest to accompany a fab group of Year 6’s down to the war memorial in Luton centre to pay our respects and also to talk to 29 NQT’s at the end of a busy day about all things literary and what gets children to pick up a book and read. A HUGE thank you to Mr Hawkins and Ms Carey for all their hard work in organising the week for us so well, especially after a lorry fire on M4 motorway caused our week to start off with a delay to the proceedings.